Applications are invited for five Understanding British Portraits Fellowship opportunities available to early career museum and gallery professionals working in UK collections. Understanding British Portraits is a professional network for those involved in portrait research, curation, interpretation, and audience engagement, e.g. curators, academics, conservators, collection-based learning professionals, independent scholars and researchers. UBP offers a programme of seminars, collection visits, Fellowships, and a resource-rich website to enable professionals to share new research, best practice, and innovative case studies. By this means, the network aims to enhance understanding of the genre in all media and time periods, for the benefit of future research, displays, and learning programmes. Applicants are invited to develop a project proposal that relates to one or more examples of British portraiture in their home collection. The project should aim to develop the applicant’s expertise around a portion of their collection, enhance their research and interpretation skills, and/or their understanding of the potential of learning programmes using portraiture. Applicants should also assess the benefits of their project to their colleagues, collection audience, and institutional records. The successful Fellows will manage their own timescales and project development, with access to the expertise of the Understanding British Portraits Steering Group members and National Portrait Gallery staff. Fellows will be able to devote a calendar month to focussing on their chosen projects, taken as a whole or as a series of days or weeks, as convenient. The budget allows for each Fellow’s home institution to back-fill their post for one month (up to £1,800, with payroll evidence) to be taken at any time between June 2019 and June 2020 inclusive. Each Fellow’s institution will be responsible for planning and administering this back-fill. The budget will allow £1,000 to fund the Fellow’s travel and accommodation costs to develop their chosen project. A further £1,200 will be available to fund at least one substantial output from each Fellowship, such as a display, publication, event, digital resource, or other learning programme, etc. (these are suggestions only, and the Steering Group welcomes effective outputs that are most appropriate to the project described). Two of the chosen Fellows will be granted an additional sum of £4,000 each to develop and co-produce a film resource that will serve as an extra output for their project. The project, including delivery of the final output(s), must be completed by the close of June 2020. Payments will be made on receipt of invoices with relevant proof of spending from each Fellow’s home institution. Fellows will be expected to take up opportunities to meet up with one another, previous Fellows, and the Steering Group. They will also be expected to contribute to the Understanding British Portraits blog, a final summary report for the website, and to share their findings by other means such as podcasts or seminar presentations, should the opportunities arise. Applicants should be early career museum or gallery staff from collections within the UK. The Steering Group is particularly interested to see proposals from colleagues outside Greater London. The project output(s) will be co-owned between the Fellows and their respective employers, and will be shared freely with the Understanding British Portraits network. Please complete and submit the application form in Word format only before Friday 3 May 2019 (5pm). Informal enquiries prior to the deadline are welcome; please contact Caroline Pegum, Researcher/Co-ordinator for the Understanding British Portraits network, at 0207 321 6427 or cpegum’at’npg.org.uk. Deadline for applications: Friday 3 May 2019 (5pm). All applicants will be informed of the UBP Steering Group’s decision before the end of May 2019. The Fellows can work on their chosen projects between June 2019 and June 2020 inclusive. Funds will be disbursed flexibly during this period, in consultation with the relevant Fellows. Leeanne is researching the remarkable collection of Fanshawe family portraits, ranging in date from 1560 to 1940, at Valence House Museum. Artists represented include Peter Lely, Marcus Gheeraerts the younger, and Mary Beale. Of particular interest is the presence of contemporary seventeenth-century studio copies of portraits, which can be related to examples in other private and public collections. Leeanne will map these Fanshawe portraits, gaining greater insights into how the family commissioned and displayed replicas. This research will be presented in a temporary exhibition at Valence House Museum in spring 2018, with accompanying visitor interpretation and booklet. Catherine is researching the photographic archive of the Redding studio run by Graham Wiseman in Rugby between 1958 and 1972. Wiseman’s collection of some 25,000 acetate and glass plate negatives record the changing demographics of the town, as economic opportunities attracted migrants from Asia, the Caribbean, and elsewhere. Catherine will identify ten portraits from the collection to be the subject of intensive research, covering the sitters’ biographies and their communities. Her research will also incorporate best practice guidelines around the storage, display, handling, and digitisation of photographic media. Intended outputs include oral recordings with sitters, interpretation material for the Art Gallery and Museum website, and temporary displays for in-gallery use and at community engagement events. Tom’s research is derived from the portrait of Catherine Cussans (1753-1834) by John Hoppner in the Holburne collection. Cussans was the paternal aunt of Sir William Holburne and Sir William’s collection forms the founding core of the museum. 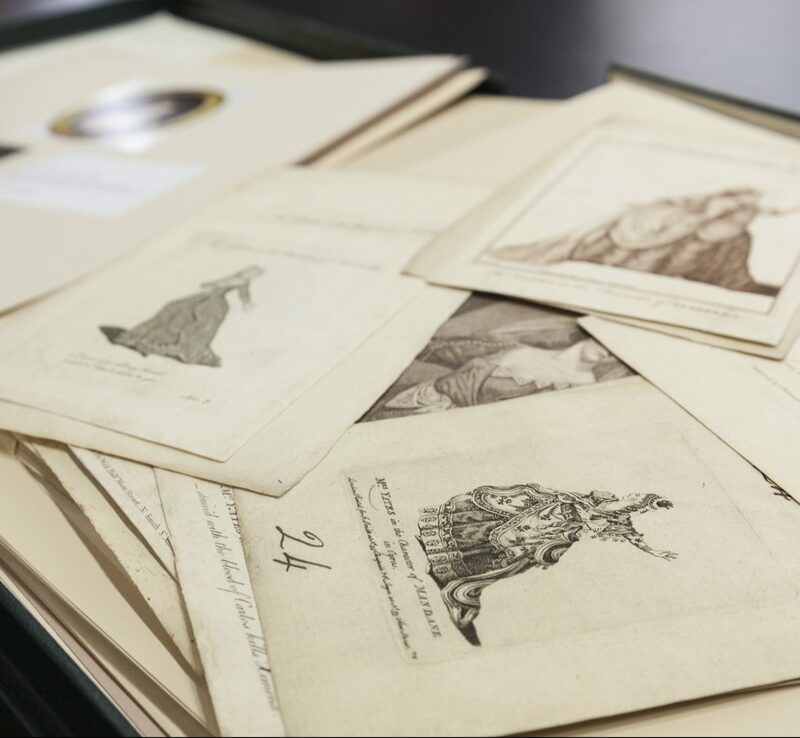 Biographical research is intended to uncover more about Cussans’ own collecting activities, the sources of her wealth which eventually helped to purchase the museum’s home on Great Pulteney Street, and the influence she had in developing her nephew’s collecting interests. Tom will also be researching Hoppner’s practice and oeuvre, in order to reassess his contemporary reception by patrons, critics, and the wider artistic community. The various outputs of this research include new content for the museum’s website, volunteer training, and a revised children’s trail. Su Hepburn, Senior Learning Officer, Royal Pavilion & Museums, Brighton. Professional Learning Fellow 2016/17. Su researched the life of Frances Garnet Wolseley, Viscountess Wolseley (1872-1936) and her portrait by Julian Russell Story dated 1884. Wolseley trained female students in the practicalities of garden design and management, formally establishing Glynde College for Lady Gardeners in 1907 and publishing Gardening for Women the following year. She was a life-long advocate of market co-operatives, smallholdings, and the revival of rural industries. Local and national archives, especially the Brighton & Hove Libraries’ Rare Books collection, were consulted to better understand the sitter’s personal and professional biography. This research informed a free online teachers’ resource which enables teachers to explore this portrait and the language of portraiture with their students. Dr Kate Noble, Education Officer, and Lucy Sercombe, Learning Associate, The Fitzwilliam Museum, Cambridge. Professional Research Fellows 2016/17. Lucy Shipp, Learning Associate – Widening Participation and Arts Award, Fitzwilliam Museum, Cambridge. Professional Research Fellows 2016/17. Kate Noble began this Fellowship with colleague Lucy Sercombe in spring 2016, and after the latter’s departure from the Fitzwilliam Museum in late summer 2016, Kate was joined by Lucy Shipp to complete the Fellowship project. Kate and Lucy researched the portrait The Twins, Kate and Grace Hoare by John Everett Millais (1829-96), oil on canvas, 1876. Their research focused on the biographies of the sitters and their contemporary social history and private artistic activities. A further strand of research sought to situate the portrait within Millais’s oeuvre. Anticipated outputs include a short film made by the Fellows, their Fitzwilliam colleagues, and local A’ Level students interpreting the portrait, as well as learning material for teachers and group leaders to use in order to encourage engagement with Victorian portraiture at the museum. Laura Millward, Collections Assistant, The Stanley & Audrey Burton Gallery, University of Leeds. Professional Research Fellow 2016/17. Laura researched the pastel portraits of John and Jane Marshall by John Russell, dated 1802. John Marshall was a successful Leeds industrialist who campaigned for the foundation of a university in the city, and was involved with other public philanthropic causes. His wife Jane was a friend and correspondent of the author Dorothy Wordsworth, sister of William. Laura explored their biographies, social and professional milieu in Leeds, and connections with the portraitist John Russell (1745-1806). Outputs include new in-gallery interpretation and a visitor resource mapping the Marshalls’ contributions to the economic and social life of Leeds.